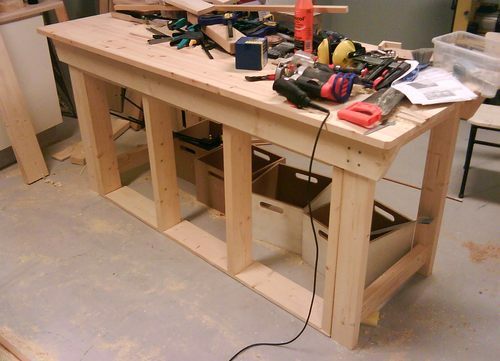 Mattias Karlsson from Sweden, sent me some pictures of the workbench he built based on my workbench design. Mattias is setting up a workshop in a rented space. 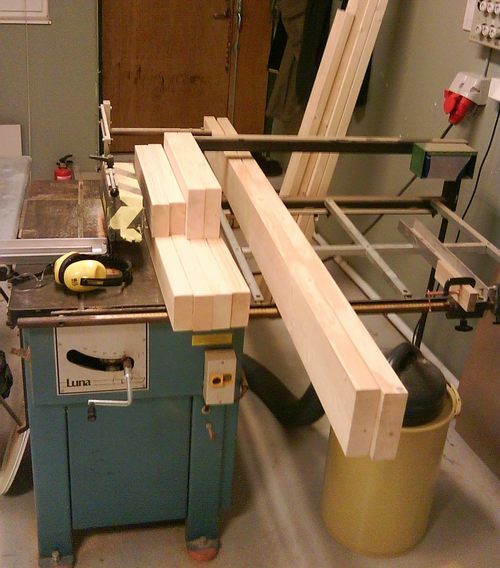 At left is all the lumber except for the top of the workbench, cut to size. 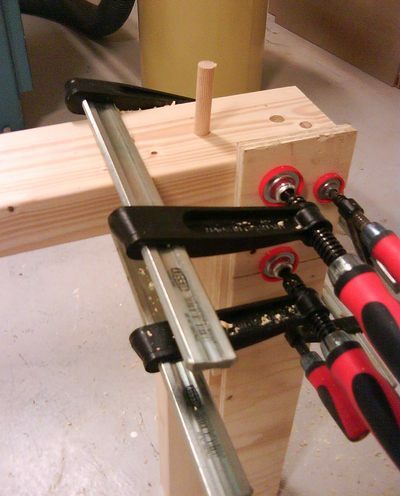 The leg frames clamped together for drilling the dowel hole though both parts in one go. 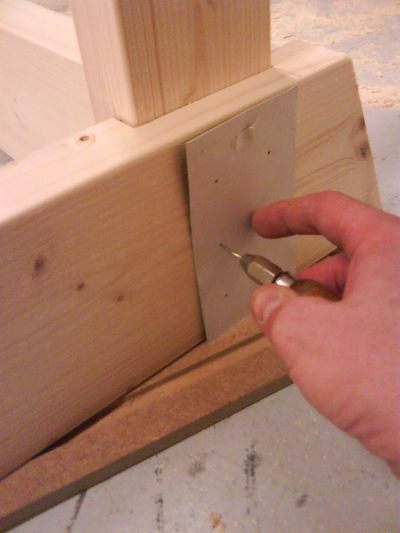 This ensures that the dowel holes will be aligned, even if the holes are drilled freehand with a hand drill. 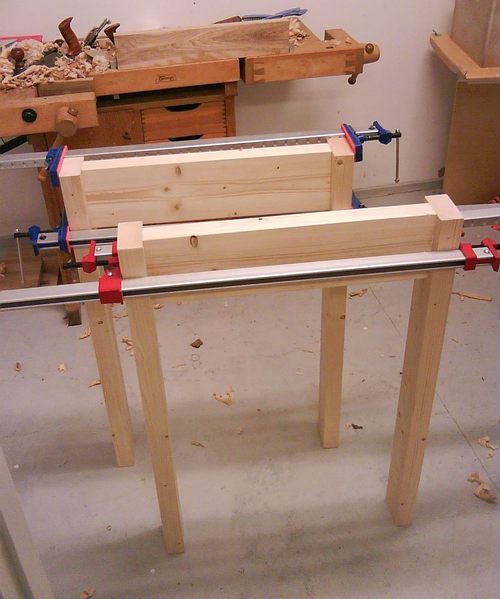 The legs for the workbench. 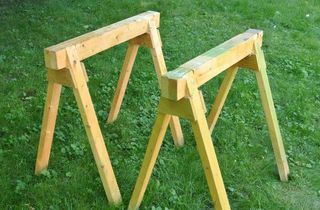 The stringers at the bottom of the legs are not yet attached. The dado in the apron rail. 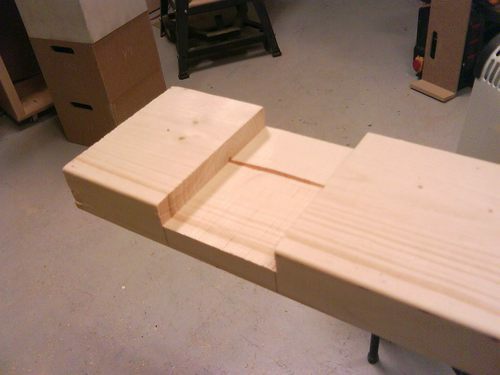 This dado needs to fit precisely around the legs to give the workbench rigidity. 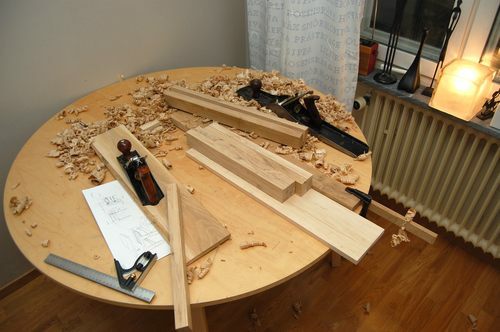 That sort of rigidity is important if you ever plan to do any hand-planing on the workbench. A nice laminated panel top. Looks so much better than an old wooden door! These big laminated panels seem to be more of a European thing. I know in Germany you can also get these large laminated up panels more easily. But in Canada and the US, people seem to be content to just use plywood. 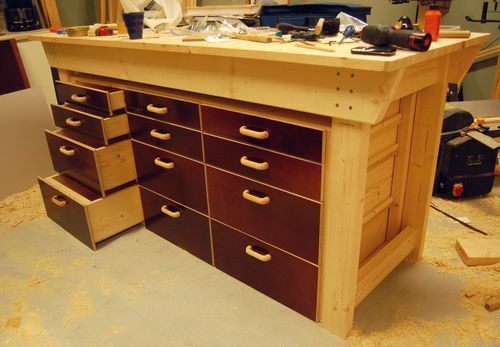 Next up - some drawers, similar to these workbench drawers. 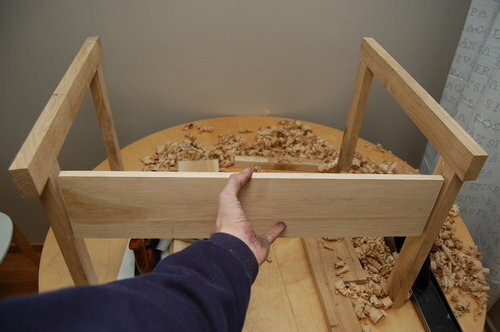 So far, just the start of the frame for the drawers exists. 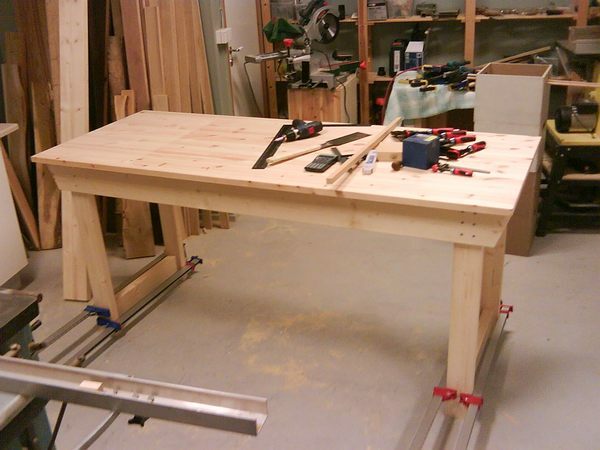 "I then got the idea to use some of the plywood I bought for the tenon jig. 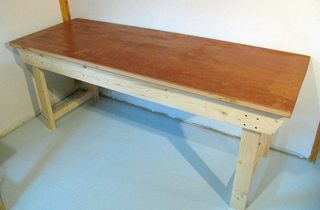 It is the kind of plywood used as concrete forms with a shiny surface. 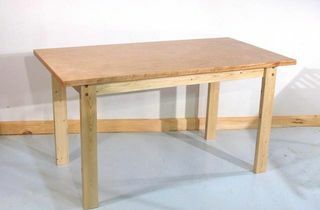 The bench kind of looks like an inverted version of your bench. I'm really pleased with the result, I have a lot of storage now. I must confess i didn't make the handles myself. They are storebought ~25$ for twelve." 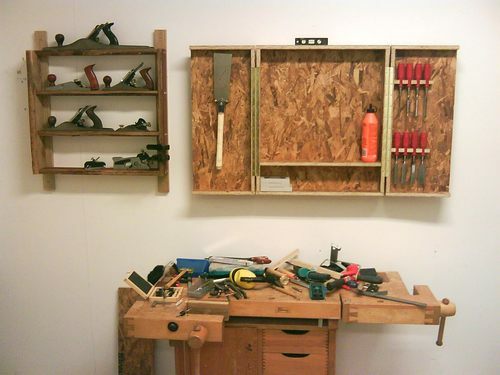 Before renting space for a workshop, Mattias Karlsson was doing some woodworking inside his apartment, and he sent me a few photos of some of the work as well. 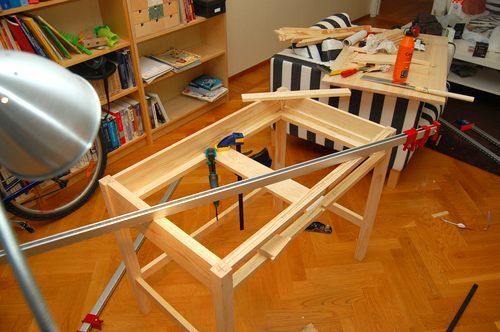 I admire that kind of passion for woodworking - to not let the lack of a workshop get in the way of building furniture. 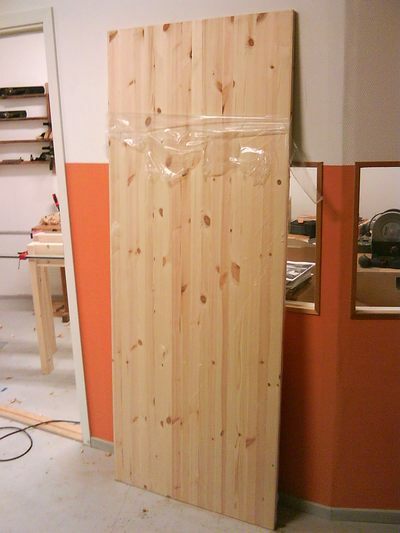 Mattias tells me that using a router on MDF in the kitchen turned out to be a bad idea. See also: A bed built in an apartment, this one by Ron King. Mattias is currently setting up a workshop in some rented space. You can see more pictures of his workshop and his work at his gallery page. I really like the photo at left. Gotta love the Swedish style. Even their cheap Ikea furniture has style.